Facebook has just unveiled that premium ads built off of Page news feed posts will now be eligible to appear on the mobile news feed and the logout page, in addition to the web news feed and web sidebar. Logout ads have enormous potential because 37 million people logout of Facebook each day 105 million per month, but there’s no other engaging content on the logout page to distract them from the ads. Essentially the evolution of Sponsored Stories, Facebook Mike Hoefflinger, Director of Marketing cited at its Facebook Marketing Conference that its new “Reach Generator” premium ad distribution system let Ben & Jerry’s reach 98% of their fans with a post and get 3-to-1 ROI, and other Pages have reached 75% of their fans. Typically, less than 16% of a Page’s fans see each of their posts. As you can see from the wireframes above, the logout page ads are massive, reminiscent of old school magazine ads. They’ll give marketers a chance to show off their Page posts in big, bold way that trumps Facebook’s tiny sidebar or news feed ads. The giant ads will need to be eye-grabbing to make users stay a few extra seconds or click, because users have trained themselves to navigate away the second they see the confirmation that they’re successfully logged out. These ads can be targeted to anyone, or all Facebook users, not just a Page’s fans. Reach Generator is available through Facebook’s premium managed accounts, and its uses a fixed fee price structure based on the number of fans a Page has. It will automatically help brands select their highest potential posts, and then amplify them through in through all the new ad placements. Facebook’s ad execs say the goal of Reach Generator is to give Pages a chance to get their content in front of more of the fans they’ve invested to acquire. Additionally, Facebook formally announced its “Offers” paid coupon news feed stories and sidebar ads which have been appearing on Facebook for since December 2011. Mobile news feed ads become available today, web news feed and sidebar ads are already available, and logout page ads will go live in April. Brands will not be able to actively select which of the 4 placements their ads will appear in. They will see reporting data afterwards on whether ads appeared on the logout page, sidebar, or news feed, but data won’t be broken out separate mobile and web news feed ads. 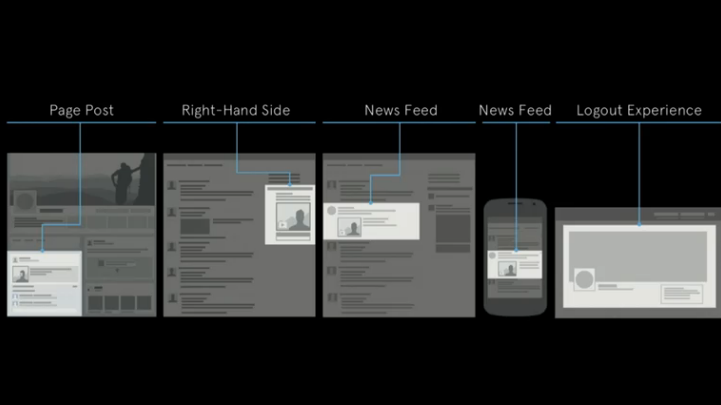 Facebook notes that its tests have shown the news feed ads receive a 5-10x higher click-through rate than standard ads. However, it will need to be careful not to overwhelm the web and mobile news feed with ads. Otherwise Facebook risks polluting its premier attraction, and making itself less addictive. We’ll have more on details on Reach Generator and the new ad placements from the Facebook Marketing Conference soon.